Size of Male: 65-75 lbs.,24-26 in. Size of Female: 60-70 lbs., 22-24 in. The Belgian Sheepdog is actually one of four kinds of Belgian shepherd. In the U.S. three of these breeds are registered as separate breeds with the AKC. In the rest of the world all four Belgian shepherds are recognized as four varieties of the same breed. 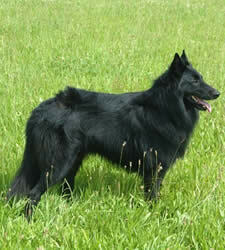 The Belgian Sheepdog is an elegant, black sheepdog who excels in obedience, herding and tracking. They work in search and rescue, as guide dogs and as therapy dogs. These dogs are also used for police and guard dog work. They love to work. They can make very good family dogs and they get along very well with children who are gentle with them. The Belgian Sheepdog, or Groenendael, was named after the village of Groenendael in Belgium. All of the Belgium shepherds had similar origins. This dog breed was developed in the later 1800s and was then listed as the Chien de Berger de Races Continentales, which includes other herding breeds. Efforts were made to create a specifically Belgian breed at this time. These hard working dogs distinguished themselves during World War I by their service as messenger dogs, ambulance dogs and even by pulling machine guns. The dogs lost popularity during the Great Depression but rose to prominence following World War II once again. It was decided that only the Groenendael could have the designation “Belgian Sheepdog” in the United States, instead of all four varieties of Belgian shepherds. These dogs are highly intelligent and can be trained to an expert level in many disciplines. They are also very protective and can be very territorial. They have been used for police work for over a century. They usually do best with an experienced owner. The Groenendael needs to be trained from an early age so the owner is in command. They also need to be well-socialized from an early age so they will be accepting of strangers and can get along with other pets. Otherwise they can be very dominant toward other dogs and animals. This breed can be very good with children if they are raised with them. These dogs need to be part of the family and never kenneled. Otherwise they can become very high strung and find ways to get into trouble. The breed has a great mental capacity and they need work and activity that will keep them happily challenged. They do extremely well in obedience, agility and other dog sports. They are a very demanding dog so you need to be an experienced dog owner and able to control a dog before you consider getting one as a pet. Living Environment – This breed does not do well as kennel dogs. They need to live in a home situation and raised with a family. They can adapt to being an apartment dog but it’s best if they have a yard. Grooming – Regular combing and brushing are necessary to prevent matting. They do shed heavily at times. Diet & Exercise – Dietary needs are normal and this breed does require plenty of daily exercise. Off-leash exercise so the dog can run is a good idea, as long as the area is safe. Jogging or biking with these dogs is recommended. Health – The Groenendael is generally a healthy breed. However they can be prone to epilepsy, dog allergies, dog eye problems, canine hip dysplasia and elbow dysplasia, and some temperament problems. The Belgian Sheepdog is extremely intelligent and they can take a high degree of dog training. They can excel at obedience, agility, tracking and most other dog sports and activities. These herding dogs can be intense about dog training (or any other activity) so they do best if you keep training fun. They respond very well to positive dog training techniques (praise, rewards).